The Snoqualmie Valley is full of fun things for the whole family! Enjoy a day of park hopping. The self-guided tour includes riverside beaches, a 500-ft suspension bridge, a journey back in time to the railway days and stunning views of Mt Si. Bring bikes along with you and have fun on the trails in and around each park. Start your day in Duvall. Park your car at Depot Park and head down the hill to the riverside McCormick Park. Enjoy sitting next to the Snoqualmie River while the kids play in the sand. 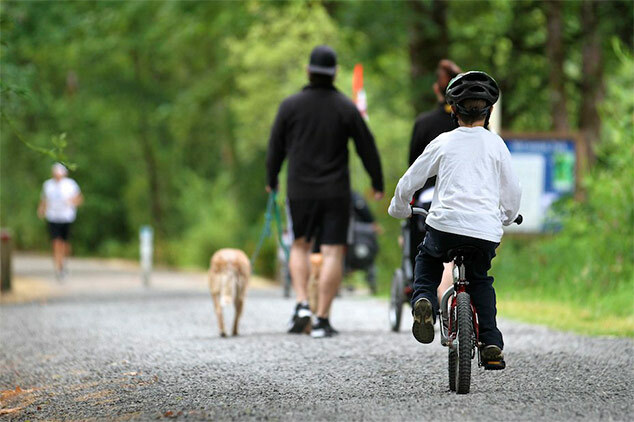 You can also enjoy a bike ride on the Snoqualmie Valley Trail, which runs right next to it. If you need a hot beverage or snack just head uphill one block to Downtown Duvall. There are a number of art installations along mainstreet and the road that leads out of McCormick Park. Next, drive ten minutes south to Carnation’s Tolt-Macdonald Park. This 574-acre park is full of fun things to see, including the stunning 500-foot suspension bridge. The bridge spans the Snoqualmie River and leads to miles of forested trails. Make sure to stop on the bridge and look through the art scope and see a holograph of the old bridge. And look down! You may see migrating salmon during the fall. You can also enjoy the series of trails and boardwalks on east side of the river. This area is bordered by the Snoqualmie and Tolt rivers and is full of wetlands. Keep your eyes peeled for beavers and other wildlife! There’s also trail from the park that connects right in to Downtown Carnation where you’ll find cute cafes and pizza joints. Next, drive the scenic Route 203 through the Snoqualmie Valley, heading upstream to Downtown Snoqualmie. Stop in at Northwest Railway Museum’s Snoqualmie Depot. This historic depot is open year round. Discover how the railway changed the landscape and culture of the region, and feel the excitement of a working railroad. The historic train runs on Saturdays and Sundays, April through October. After your visit to the museum, you can cross the street to peruse the fun shops full of treasures and sweets. Head to your final park by continuing south. In about five minutes you’ll reach Tollgate Farm Park in North Bend. This park is part park and part farm and sits squarely in front of majestic Mount Si. Kids can have fun on the playground or you can bring out the bikes and enjoy the the one-mile loop trail around the cow pasture. Just a couple blocks to the south is Historic North Bend downtown district. Enjoy more views of Mount Si while you explore this fun town. You can also stop in at the Snoqualmie Valley Historical Museum and hear stories about the Valley.